St. Mary of Egypt and I go way back. It doesn’t feel like it sometimes. It feels like just yesterday when I heard her story for the first time. I was just becoming Orthodox and hadn’t yet picked a patron saint. 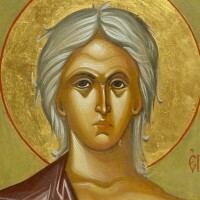 And then the entire narrative of St. Mary of Egypt was told, and I couldn’t stop thinking about it. I won’t go over it here — if you haven’t heard it, you can read it HERE — but suffice it to say, my decision was made for me. In my case, the adage is true that I didn’t pick my saint; she picked me. And she still does. It has been more than 30 years since we first met, but there are still lessons that I’m learning with Mother Mary. If I had to come up with my top 5 lessons, it might look something like this. If you know the entire story, you know that he got a clear answer. It was almost a kind of trick question — the person he was eventually led to wasn’t a monk, and wasn’t a man. The takeaway: Don’t be too full of yourself, if you’ve got a few years and a few fasting seasons under your belt. And don’t think you have a clear handle on where holiness can be truly found. Repent without fear. After 17 years of dissolute living, Mary decides to leave Alexandria and go see the Feast of the Exaltation of the Cross in Jerusalem, just for the sport of it, really. The takeaway: True repentance isn’t for the faint of heart. “The kingdom of God suffers violence, and the violent shall take it away.” Just as Mary had lived a desperately sick life for 17 years, she suffers terrible bouts of double-mindedness and temptation for the first 17 years that she goes off into her exile in the desert. She is wracked by desire — for the flesh, for food, for wine. She is even oppressed by bawdy songs she used to know. She soon had nothing to eat or drink, nothing to wear. She was exposed to the elements and utterly alone, and she must have asked herself many times what she was doing out in the middle of nowhere. But she didn’t give in and she didn’t allow it to make her faith smaller — she fought! It seems our lot sometimes to suffer from the same sins and feel always as if we fail. It’s a brief passage in the narrative, but it’s worth a lot to me. There’s certainly nothing wrong in getting the best education you can, but even that can become misleading. And perhaps, in the 21st century, we’re a little too inclined to be impressed with our own cleverness. The takeaway: The font of all wisdom is God, and He bestows it where and when He pleases. Don’t seek fame … seek God. Zosima sees Mary a total of three times, and the third time, he sees her just in order to bury her. And it’s only then that he realizes that he never asked her her name (so maybe he’s not so astute after all!). But the words are scratched into the earth next to her, “Abba Zosima, bury on this spot the body of humble Mary.” Up until that moment, no one would have known who she was. Apart from Zosima’s three visitations, she would have died in total obscurity, and all of her story and her 47 years of desert exile would — it seems — have been for nothing. But that’s not, as we know, how the story ended. Zosima did bury her, with the help of a lion, and went back and told his fellow monks about the woman he encountered. We don’t know what year that was, but it was written down by Patriarch Sophronios of Jerusalem in the 7th century and re-written by John of Damascus, among others. The account was popular in medieval Europe and eastern Mediterranean lands, and was translated into many languages. 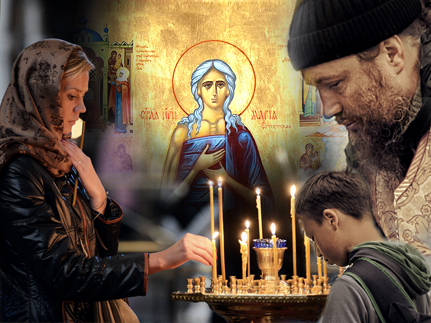 And now — 15 centuries or so later — the story is still known by Christians around the world and recalled by Orthodox on the fifth Sunday of Lent every year. Could anyone have ever expected to gain such recognition? The words of the rather silly song “Fame” keep saying “I’m gonna make it to heaven … Remember my name …” Unfortunately, we sometimes think that we can accomplish lasting recognition by showing off some talent, making a splash with our fellow man. But how long does that last? What’s it really worth? More importantly, where would we be now if there weren’t men and women like St. Zosima and St. Mary who had rejected all the world’s possibilities and given their whole heart to God? The takeaway: Be … like … St. Mary. I thank God for all His saints. I ask for all their prayers. This Sunday, once again, I ask for the prayers of our lovely Mother Mary of Egypt. Goodness knows, she still has so much to teach me every year. What Is a Christian End to Life?